Welcome to Brookline, MA! Vanguard Realty has been selling Brookline real estate for over 8 years, and some of our agents have lived there for 15 years or more. Our Brookline office is conveniently located in the heart of Brookline Village at 54 Harvard Street, across from St. Mary’s Church. 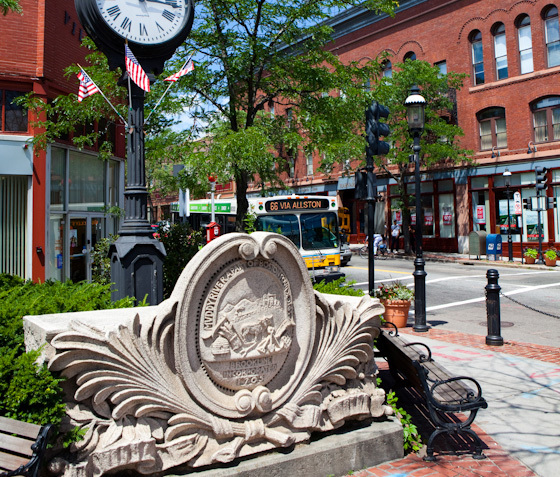 So what’s great about Brookline? First, for an urban community Brookline has a huge amount of green space. According to the Brookline Parks & Recreation website, there are over 49 parks and playgrounds in town. There’s Amory Park, Halls Pond Nature Area, and Larz Andersen Park just to name a few of the more spectacular public parks. Brookline is also very convenient to downtown. The C and D lines run through town, with the D line offering a very quick commute downtown. You also have easy access to Storrow Drive and Harvard Square. Brookline borders Jamaica Plain, Boston proper, Brighton, Allston and Newton. It has a residential exemption, meaning that residents who owner-occupy their homes get a discount on their tax bill. One of the best features of Brookline is its outstanding public school system. The schools are consistently ranked among the nation’s best, so the town draws a steady stream of parents who want the best education possible for their kids. Real estate in Brookline is varied, with lots of condo buildings in the center of town clustered around the main streets, and more single family homes in the Chestnut Hill, Fisher Hill, Cottage Farm and South Brookline areas. Brookline is even home to a large working farm, Allandale Farm, located in the Chestnut Hill area bordering Jamaica Plain. Brookline has been home to many notables, including the Kennedy family, Frederick Law Olmsted, the architect H.H. Richardson, and of course Conan O’Brien. The key neighborhoods in Brookline are St. Mary’s, Cottage Farm, Coolidge Corner, Washington Square, Brookline Village, Chestnut Hill, Fisher Hill, and South Brookline. The commercial heart of Brookline is Coolidge Corner, home of the Coolidge Corner Theatre, Zaftig’s Deli, Paris Crepery, and a slew of great restaurants, bars and shops. Other major commercial districts are Washington Square, Brookline Village and, to a lesser extent, St. Mary’s, which is right on the border between Boston and Brookline.